This is an old revision of this page, as edited by 104.129.204.135 (talk) at 17:57, 2 December 2016 (→‎Biography). The present address (URL) is a permanent link to this revision, which may differ significantly from the current revision. Staples singing during the 2006 NEA National Heritage Fellows concert. Her voice has been sampled by some of the biggest selling hip-hop artists, including Salt 'N' Pepa, Ice Cube and Ludacris. Staples has recorded with a wide variety of musicians, from her friend, Bob Dylan (with whom she was nominated for a 2003 Grammy Award in the "Best Pop Collaboration With Vocals" category for their duet on "Gonna Change My Way of Thinking" from the album Gotta Serve Somebody: The Gospel Songs of Bob Dylan) to The Band, Ray Charles, Nona Hendryx, George Jones, Natalie Merchant, Ann Peebles, and Delbert McClinton. She has provided vocals on current albums by Los Lobos and Dr. John, and she appears on tribute albums to such artists as Johnny Paycheck, Stephen Foster and Bob Dylan. 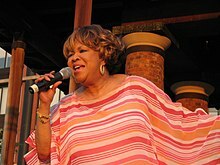 In 2003, Staples performed in Memphis at the Orpheum Theater alongside a cadre of her fellow former Stax Records stars during "Soul Comes Home," a concert held in conjunction with the grand opening of the Stax Museum of American Soul Music at the original site of Stax Records, and appears on the CD and DVD that were recorded and filmed during the event. In 2004, she returned as guest artist for the Stax Music Academy's SNAP! Summer Music Camp and performed, again at the Orpheum and to rave reviews,[who?] with 225 of the academy's students. In June 2007, she again returned to the venue to perform at the Stax 50th Anniversary Concert to Benefit the Stax Museum of American Soul Music, produced by Concord Records, who now owns and has revived the Stax Records label. I’ve been singing my freedom songs and I wanted to stretch out and sing some songs that were new. I told the writers I was looking for some joyful songs. I want to leave something to lift people up; I’m so busy making people cry, not from sadness, but I’m always telling a part of history that brought us down and I’m trying to bring us back up. These songwriters gave me a challenge. They gave me that feeling of, ‘Hey, I can hang! I can still do this!’ There’s a variety, and it makes me feel refreshed and brand new. Just like Benjamin Booker wrote on the opening track, ‘I got friends and I got love around me, I got people, the people who love me.’ I’m living on a high note, I’m above the clouds. I’m just so grateful. I must be the happiest old girl in the world. Yes, indeed. Mavis!, the first feature documentary about Staples and the Staple Singers, directed by Jessica Edwards, had its world premiere at the South by Southwest Film Festival in March 2015. Mavis! will screen in theaters and on HBO in February 2016. ^ "Music and Art, Performances at the White House". The White House. Retrieved November 6, 2015. ^ "Mavis Staples". Wait Wait… Don't Tell Me!. National Public Radio. 2008-12-20. Retrieved 2010-09-04. ^ Tony Cummings (February 1, 2008). "Mavis Staples: From Stax, to Prince, to an acclaimed Civil Rights album". Cross Rhythms. ^ Cohen, Jonathan Cohen & Martens, Todd (December 19, 2006). "Mavis Staples Gets Personal On Anti- Debut". Billboard. ^ Wilkey, Robin (August 15, 2011). "Win Butler & Mavis Staples Perform Live Together". Huffington Post. Retrieved 25 December 2013. ^ Jenny Charlesworth (February 13, 2011). "Mavis Staples Wins First Ever Grammy for Best Americana Album". Spinner. ^ "Mavis Staples Enlists Bon Iver, Nick Cave, Neko Case, M. Ward, More for New Album Livin' on a High Note". Pitchfork. January 7, 2016. Retrieved February 15, 2016. ^ "Mavis! documentary at 2015 SxSW Film Festival". ^ "Mavis Staples - Civil Rights Activist, Singer - Biography.com". Biography. A+E Networks. Retrieved September 9, 2015. ^ Torres, Richard (January 22, 2014). "New Mavis Staples Biography Will 'Take You There' : NPR". NPR. WRN Broadcast. Retrieved September 9, 2015. ^ "Career vs. Kids: No Hard Decision for Mavis Staples | TheNotMom". TheNotMom.com. Retrieved July 2, 2013. ^ "Mavis Staples: 'I often think what would have happened if I'd married Dylan'| theguardian". TheGuardian.com. Retrieved February 22, 2016.